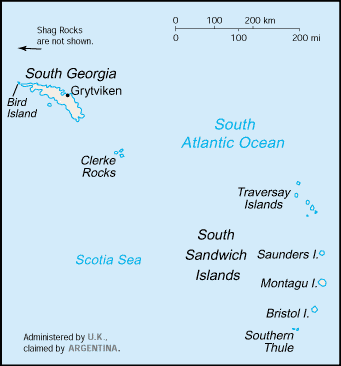 South Georgia and the South Sandwich Islands  are two groups of sub-Antarctic islands of the Southern Ocean east of the southern tip of South America, north of Antarctica. The islands are an overseas territory of the United Kingdom that are administered from the Falkland Islands. While whalers and seal hunters built settlements on these islands, the only permanent settlements today are at the various research bases. A "city" in these islands may consist of no more than five people during the winter months. King Edward Point - Seat of Government where the Government Officer resides. Is the port of entry and home of the Fishery Research base run for the Government of South Georgia and the South Sandwich Islands (GSGSSI) by the British Antarctic Survey. 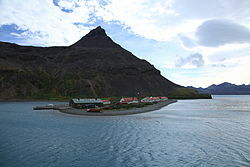 Grytviken - One of several former whaling stations on South Georgia. Bird Island - An island located at the north-west tip of South Georgia on which long-term research by the British Antarctic Survey is ongoing. The islands allow visitors to land at multiple points around the islands. Usually all the documentation will be taken care of by the cruise or expedition you are with. Independent travel by ship requires prior approval of your entire itinerary. The application forms are available online . The main requirements for independent travellers are to have insurance and to ensure you are self-sufficient. A fee of £105 is also payable per passenger for visits up to 3 days. Anyone wishing to sleep ashore overnight must have their proposal vetted by the Government's Expeditions Advisory Panel. This process will cost you £1000 per expedition. As a result, nearly all visitors to the islands sleep aboard ship at night. This page was last edited on 6 December 2018, at 12:18.